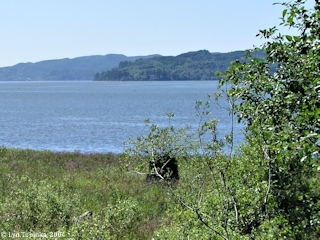 "Grays Point and Portuguese Point, Washington"
Click image to enlarge From Knappton Site, looking towards Grays Point. Grays Point is the western end of Grays Bay, and Harrington Point, in the distance on the right, is the eastern end. Image taken April 9, 2004. Grays Point is the downstream point of Grays Bay, at Columbia River Mile (RM) 20, and Harrington Point, at RM 24, is the upstream end. Grays Point is rather broad-tipped, with the actual "Point" being the western tip sticking into the Columbia River. Just around the tip to the east is a smaller point sticking into Grays Bay called Portuguese Point, where Lewis and Clark set up camp on November 8 and 9, 1805. Upsteam of Grays Point and Grays Bay is Altoona, Washington and Pillar Rock. Downstream is the old Knappton site, Megler, Washington and Station Camp, and Point Ellice. Grays Point was named after American Captain Robert Gray, who, in 1792, became the first European to explore the Columbia River. Portuguese Point is the west entrance point of Grays Bay. 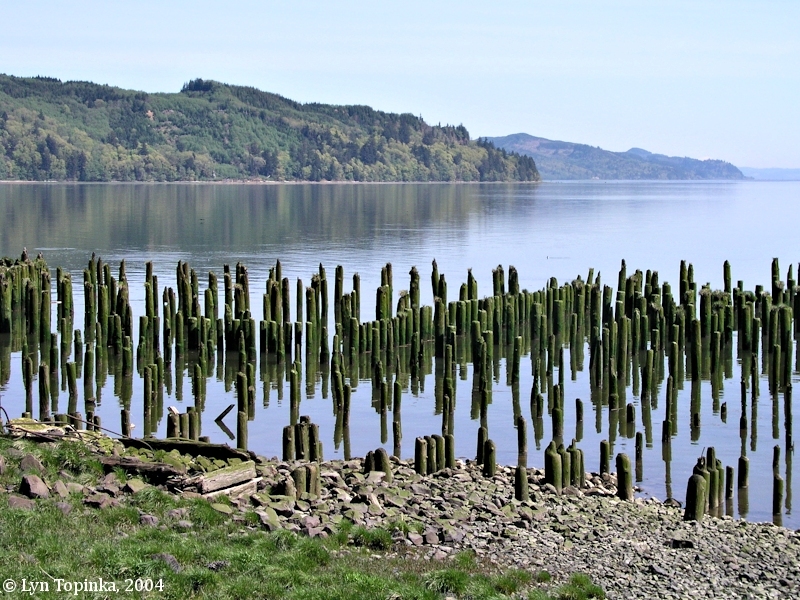 Hitchman, in Place Names of Washington (1985) writes that Portuguese Point was named by early Columbia River navigators, with some evidence that the name ties in with a shipwreck. Lewis and Clark's route map (Moulton, vol.1, map#82) shows the camp of November 8 and 9, 1805 at Portuguese Point. Lewis and Clark's camp of November 8 and 9, 1805, after coasting along the shore of Grays Bay, was on the Grays Bay side of the Grays Point, at a place called "Portuguese Point". The men referred to the point as "Cape Swell". Lewis and Clark's previous campsite was across from Pillar Rock, and their campsite of November 10 and 11, 1805, was at Hungry Harbor. 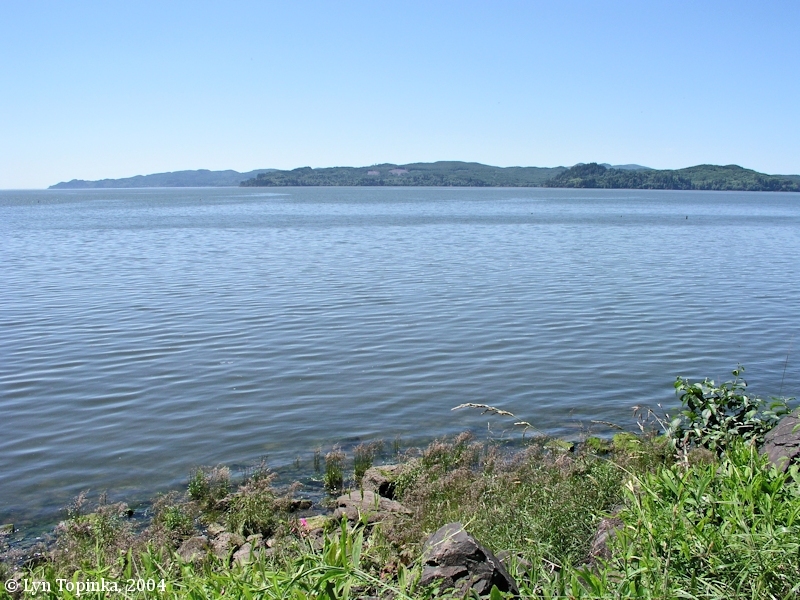 In May 1792 American Captain Robert Gray entered the Columbia River and anchored off of Grays Bay and again off of Grays Point. Gray went ashore at Grays Point. Five months later Lieutenant William Broughton of the British George Vancouver Expedition entered the Columbia River and journeyed 100 miles up the Columbia. He named Grays Bay after Robert Gray who had preceeded him. Lewis and Clark spent the nights of November 8 and 9, 1805 on the Grays Bay side of Grays Point (today called Portuguese Point). They called the point "Cape Swell", after the high tidal waves. In 1839, Sir Edward Belcher of the British Admiralty Survey, mapped the point as "Cape Broughton", after British explorer Lieutenant William Broughton of the Captain George Vancouver expedition. In 1841, Charles Wilkes of the U.S. 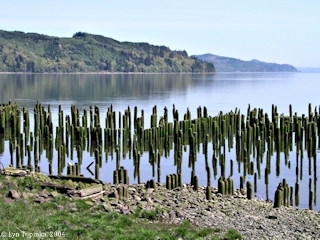 Exploring Expedition, called the point "Grays Point" for American Captain Robert Gray who, in May 1792, was the first European to explore the mouth of the Columbia River. Wilkes' map "Sheet No.2 of Columbia River from Astoria to Katalamet Head" shows Portuguese Point labeled as "Burnie Point" and Rocky Point labeled as "Kutzule Pt.". Grays Point is not labeled on the map. The 1851 map "Mount of Columbia River", by the Survey of the Coast of the United States" has Grays Point labeled as "Pt. Gray". "... Cape Broughton is on the north side of the river, N. NW. 3 1/4 miles from Tongue Point, and NE. 1/4 E. 5 3/5 miles from Ellis Point. It was named by Belcher in 1839, but was called Gray's Point by the United States Exploring Expedition. This last designation was also applied by the Coast Survey in 1852. The head between Ellis Point and Cape Broughton was named Chatham Head in 1839. Gray's Bay lies to the NE. of Cape Broughton, and was named, in 1792, in honor of Captain Gray. ... "
"... It was named by Belcher in 1839, but was called Gray's Point by the United States exploring expedition. On the Coast Survey charts it is called Cape Broughton ..."
In 1875, on the U.S. Coast Survey's Chart No.641, "Columbia River, Sheet No.2", Grays Point and Portuguese Point were labeled "Gray's Pt." and "Portuguese Pt." respectively. "... Gray's Point -- This is the moderately high wooded point on the north side of the river three and five-eighths miles north twenty-eight degrees west (N. 28o W.) from Tongue Point. It lies four and seven-eighths miles north forty-five degrees east (N. 45o E.) from Point Ellice. There is as much as ten fathoms of water immediately under the point, but there is no deep channel to the east or to the west. Yellow Bluffs lie four miles north seventy-three degrees east (N. 73o E.) from this point, and between them lies Gray's Bay. It was named Cape Broughton by Belcher in 1839, but was called Gray's Point by the U.S. Exploring Expedition in 1841. On the earliest Coast Survey charts it was called Cape Broughton, but on the later ones it is designated Gray's Point. The point in the bight between Point Ellice and Gray's Point, now called Cliff Point, was named Chatham Head by Belcher in 1839. There is no name to this bight, but near its deepest part there is a large establishment embracing a cannery and a saw-mill at Knappton, formerly Cementville. The easternmost projection of Gray's Point is known as Portuguese Point. ..."
NOTE: "Yellow Bluffs" is the location of today's Pigeon Bluff, on the eastern point of Grays Bay, downstream of Altoona and Harrington Point. The 1890 U.S. Coast and Geodetic Survey's Chart No.6141, "Columbia River, Sheet No.2", matched the 1858 printing with "Gray's Pt." and "Portuguese Pt.". "Gray's Bay" and "Gray's River" were also labeled. However, Deep River was listed as "Alamicut River". 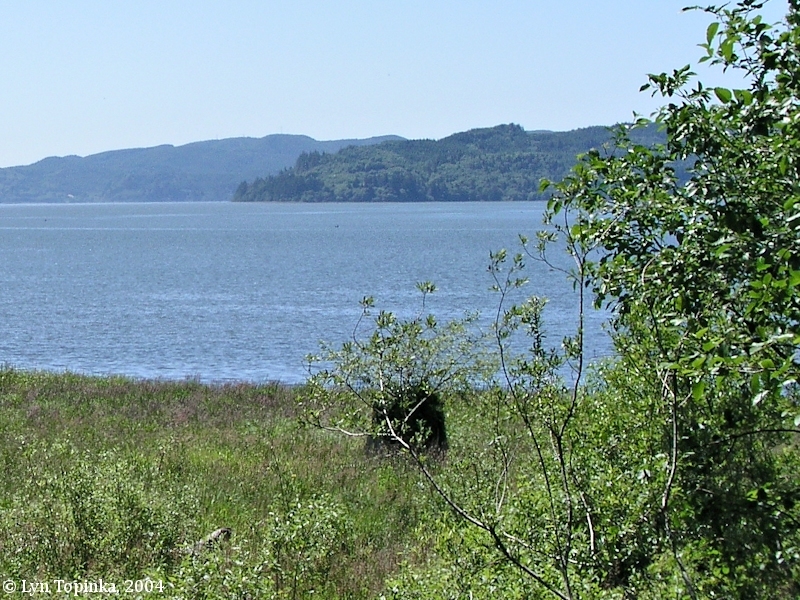 Click image to enlarge Grays Point, Washington, as seen from across Grays Bay. From the road to Pillar Rock, between Pigeon Bluff and Harrington Point, looking west towards Grays Point. Portuguese Point is at the base of Grays Point. Image taken June 16, 2004. Click image to enlarge Grays Bay from Pigeon Bluff, Washington. From the road to Pillar Rock, near Pigeon Bluff (Mile Post 5). Across the bay can be seen Point Ellice (left), Grays Point/Portuguese Point (middle), and Rocky Point (right). Image taken June 16, 2004. "... FRANKFORT: Early Columbia River community near Portuguese Point (also called Barney's Point for Barney Gallagher who had a homestead there in 1876) in south central Pacific County. Named by (James) Frank Bourn and Frank Scott in their own honor. Bourn and Scott purchased land around Portuguese Point, formed the Frankfort Land Improvement and Investment Company on April 30, 1890, and on May 5th filed a town plat "where fashionable people would walk the streets - where commerce and industry would prosper". Frankfort had three golden years (1890-1893). Land sales and boomtown development were brought to an end by the Panic of 1893. Frankfort survived until World War I but the plat was not vacated until 1952. During its existence Frankfort was only accessible by water. The town had dozens of residential dwellings owned by fisherman, a land office, the Gannon Hotel, a newspaper (Frankfort Chronicle), a school, a store, a saloon, and a post office established June 6, 1890 (closed February 28, 1918). The last person living in Frankfort died in 1964. ..."